Julien Solari at Thierry Voisin gets in touch with news of a €1 million price drop on his joint listing for sale with Wes Sanford at Northrop & Johnson, the 61.3 metre expedition yacht Voyager. Built by Spanish yard Astilleros y Talleres Celaya to a design by Sparkman & Stephens, Voyager was delivered in 1973. She was purchased in the early 2000s with the purpose of transforming her into the ultimate expedition vessel for charter. Carrying a helicopter with refuelling capability plus a large array of tenders and toys, she was used for extended cruising periods from remote tropical waters to extreme Alaskan winters. Following her sale in 2008, the current owners had the interior completely redesigned in a more modern style, as well as two technical refits in 2010 and 2012-2013. Twin 1,125hp Caterpillar engines give Voyager a range of 4,800 nautical miles and, lying in Turkey, she is now down to €6.4 million. 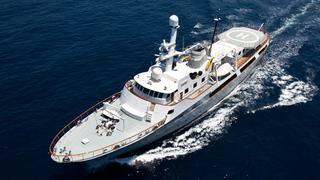 See full details, specs and a photo gallery of superyacht Voyager for sale.